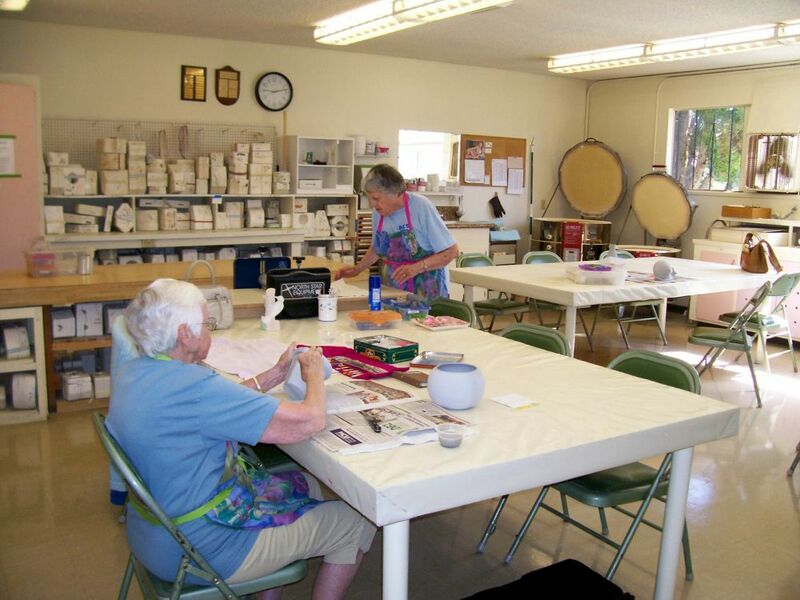 While the Ceramic Club does not offer formal classes in ceramics, there is always someone willing to help anyone new to the craft. Mary Clark will offer personal tutoring on Monday and Friday mornings. The Ceramics Club is a friendly bunch and everyone is willing to help each other. The studio owns approximately 700 slip molds. Each member can buy slip as needed to pour into the molds at $5 per half-gallon jar. If you prefer not to pour molds yourself, some greenware or bisque is provided for sale. Please view items placed next to window (facing hallway), or Karol Drylie will pour molds as requested every Monday. Handbuilding with solid clay is also available. Clay is available in the studio for $1 per pound or you may provide your own low-fire clay. We have a slab roller and plenty of tools for handbuilding available for use in the studio. The studio has brushes that can be used in the studio but most people purchase their own brushes. It’s best to have a variety of brushes of different shapes and thicknesses. The kiln is loaded each Friday and is fired on Saturday. Monday is pick-up day for items that have been fired. The Ceramics Club holds formal club meetings twice a year. Dues are $20 every 4 months ($60 per year). Envelopes are provided (located in paint cabinet) to place your dues into. Dues cover the cost of the glazes and kiln firings. Select the Photo Album to see some of our work. For membership, please select here for the form, download and submit the form through the Contact Us Tab.